Everyone seems to be going 360, even thermal cameras now. While panoramic cameras provide sweeping coverage area, traditional approaches could not 'see' very far nor terribly well in the dark. Now, a new high end and expensive thermal 360 offering aims to overcome these issues for monitoring critical infrastructure and military bases. In this note, we examine the features and pricing of this thermal 360 compared to Sony XI and ipConfigure GWAS offerings. The IR Revolution 360 is a panoramic thermal imaging system with a cooled thermal sensor mounted on a rotating head, creating a full 360º panorama every second. The camera is typically mounted on its own tower or atop buildings. Three sensor configurations are available, with specified detection ranges between 1-3km, in vertical fields of view of 5º, 10º, and 20º. No optical zoom is provided, only digital zoom, as this sensor uses a fixed lens. 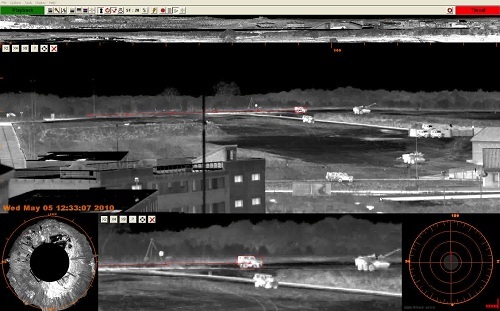 Instead of stitching together images, as some wide area surveillance systems (such as ipConfigure's GWAS system or Sony XIs), the thermal sensor creates the panoramic image by scanning each line in the vertical field of view. This image is output in a proprietary image format (i.e., not H.264 or MJPEG) for processing by their central server and client. The full panaromic image can be seen at top, with a large zoom window below, and a smaller, more closely zoomed window on the center bottom. The image at left bottom is a "disk" view, a circular composite of the panorama. Users may create any number of zoom windows by clicking and highlighting areas in the panorama or disk views. Cyclope also performs image analysis on the full panorama, detecting and tracking object. In the image above, this is illustrated by the bounding box around the center vehicle, with its travel path in red behind it. No classification of objects is performed, only highlighting of the object present, and alert generation. Operators must classify the object. The system compensates for areas in constant movement by marking them as "normal" after a learning period. Things such as blowing tree limbs, a running generator, or wave movement are ignored by this feature, so they are less likely to generate nuisance alarms. Finally, Cyclope may perform recording functions in addition to monitoring. Images are not typically recorded in their raw format, as each camera generates about 1TB of data per day. Instead, if recording is desired, video is transcoded to an AVI format, 25-30% of the original size. Outward: HGH provides an SDK for command and control software wishing to integrate to them. XML data with object position data is provided, to generate alerts and slew cameras to object positions. Due to their proprietary format, however, video is not provided to third-party systems. Given HGH's typical markets (defense, ports and airports, etc. ), current integrations are limited to high-end software platforms not typically seen in commercial security, Ageon and SRI Sarnoff. 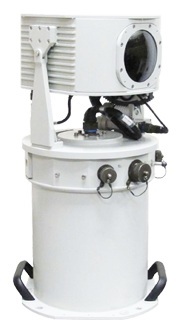 Inward: HGH is capable of integrating with third-party sensor systems, such as seismic, acoustic, and others, which may generate alerts in the Cyclope software. Track data may also be used to control PTZ cameras via Pelco-D protocol, though this video is not displayed or recorded by Cyclope, but must be managed separately. Operators may also point and click on areas in the panoramic image to move integrated PTZ cameras to specific positions. An IR Revolution 360 system has end user pricing of ~$250,000 USD. HGH has no channel sales through distribution, and sells direct to end users or through integrators. No Color/Zoom Option: While HGH uses only a thermal sensor, both ipConfigure and Sony use visible cameras as base, with thermal cameras an additional option. Both also offer zoom camera options directly integrated with their software, instead of in a separate interface. HGH requires separate integration of PTZ cameras. Lower panorama resolution: While Sony and ipConfigure create panoramas in the hundreds of megapixel to gigapixel range, a full HGH panoramic image is between 3 and 12MP. This is due to the much lower resolution of thermal sensors than megapixel cameras used in ipConfigure and Sony. Wider FOV width: Sony and ipConfigure offer a 270º max, compared to the full 360º of HGH. This may be a disadvantage in some cases, but we expect that many installations do not require all of the 360º panorama created by HGH, with dead space created by buildings or other structures. Shorter FOV Height: The IR Revolution 360 is limited to a maximum 20º field of view. Both ipConfigure and Sony may be configured for 30º FOVs. This may be preferable in some locations, depending on the geography of the monitored area. Much Faster Framerate: HGH creates a full frame every second. ipConfigure, by contrast, takes 24-70 second to create a single frame. Sony generates a frame every 15-75 seconds. While none are super high frame rate, HGH's view/image is updated much faster than comparables, which helps improve situational awareness of real time events. Similar Price Range: All 3 units cost hundreds of thousands of dollars. While ipConfigure's GWAS can cost less than $100k, that is for a non thermal option. With thermal, both ipConfigure and Sony will likely be in similar if not higher pricing though with the added benefit of the color / megapixel camera. The biggest advantage of the HGH is its (relative) fast frame rate. The biggest disadvantage is its lack of built-in color/megapixel camera.